Average Weight	: 85 - 130 lbs. Rottweilers are affectionately also called 'Rotts' and originally were developed to drive cattle and pull carts for farmers and butchers [hence the Rottie's broad chest and heavily muscled body developed to handle these tasks]. Their great strength and stamina coupled with warm, dark-brown eyes that reflect a mellow, intelligent, alert, and fearless expression made them then and now a useful and loving family member. It is believed that Rottweilers descended from the Molossus, a mastiff-type dog. Their ancestors marched to Germany with the Romans, driving the cattle that sustained them as they conquered the known world. As the army traveled, these big dogs mated with dogs that were native to the areas they passed through Germany and this laid the foundation for the Rottweiler breed we know today. History documented an interesting story related to Rotties. As the Romans advanced with their cattle and these dogs they passed through the southern area of Germany, where they set up colonies to take advantage of the climate and soil ~ very suitable for agriculture. During this time they built their homes with red tiled roofs. Over the centuries these colonies were destroyed and buried. 600 years later inhabitants of this same area began building a new church and in excavating their site for the church came upon ancient Roman baths and uncovered one of the red-tiled villas. This discovery inspired them to name their newtown "das Rote Wil" (the red tile). Over the centuries, Rottweilers flourished in this area known for it's cattle, much like being a German equivalent of a Texas 'cowtown' and the inhabitants of that era used the Roman Molossus dogs to drive their cattle into town for butchering. To keep their money safe from thieves after selling their livestock, the cattlemen put their filled purses around their Rottweiler's neck for safe keeping. Butchers themselves began to employ these dogs to pull their carts loaded up with meat. Eventually, rail transport replaced cattle drives and the Rottweiler breed began to deteriorate and almost became extinct. At a dog show in Heilbronn, Germany, in 1882, only one nondescript Rottweiler was exhibited, but by 1901, when the Rottweiler and Leonberger Club were founded the breed standard was written and their popularity was on the rise. Rottie's appearance and character has held firm throughout the decades. Rottweilers protective watchdog and guard sense-ability, coupled with their intelligence and ease of training was soon recognized by the armed forces and they were recruited for police work. Several Rottweiler breed clubs were formed over the years, but the one with staying power was the Allgemeiner Deutscher Rottweiler Klub (ADRK), founded in 1921. The ADRK survived World War II and has continued to promote good breeding programs in Germany and throughout the world. This club is dedicated to preserving the working ability of the Rottweiler. It's believed that the first Rottweiler was brought to the United States by a German immigrant following WWI. The first litter was whelped in 1930, and the first dog registered by the American Kennel Club was Stina v Felsenmeer in 1931. After World War II, the breed started becoming even more popular. At the time Rottweilers were seen and trained for their talent in competitive dog sports such as Obedience, recognized by the AKC. The height of the Rottweiler's popularity hit during the mid-1990s when more than 100,000 were registered with the American Kennel Club. •	Powerful, Imposing, great Guard & Watchdog. •	Calm, Easy to train, Courageous and Devoted. •	Loyal and Protective. Will defend fiercely if tested. •	Highly intelligent ~ these dogs have proven themselves in the world of police, military and customs work over many centuries. •	Serious, even-tempered, brave, confident. •	Dog owner should have calm leadership skills & invest the time in training, be firm and able to handle this dog's massive muscle bulk. •	Not a great dog to leave confined, alone in a building or backyard. They need to be part of a 'pack' lifestyle, living WITH their owners, not left to be outside protecting property. •	Are good with children, cats and other dogs if socialized at an early age. •	Good with family friends, but can sense trouble from strangers if apparent and forthcoming. •	Prone to hip dysplasia. •	Known to become overeaters. •	Requires plenty of exercise and mental stimulation. •	Love to jog ~ a great jogging partner. •	Enjoy swimming and running beside bicycles [not too fast or too far]. If they pant ~ give them rest and plenty of water! •	Often love to retrieve thrown balls. •	Will do OK in apartment lifestyles, but prefers a fenced yard and more open spaces. Mental stimulation is a must because these dogs can become bored quite easily and this can lead to destructiveness, health problems and aggressiveness. Rottweilers are friendly but do have a natural tendency towards dominance. Aggressiveness is not a characteristic of properly bred Rottweiler, but can be brought out in the breed without proper training and socialization. Males tend to be aggressive with other males, altering the dog if only a pet is suggested. As a rule, they don't bark unnecessarily and are great guard dogs, alerting when there is danger of something out of the ordinary. Rotties are active, happy and obedient, only wanting to please their master. Harsh words and actions will hurt Rotties feelings and are not needed to train them, as they are very quick to learn. 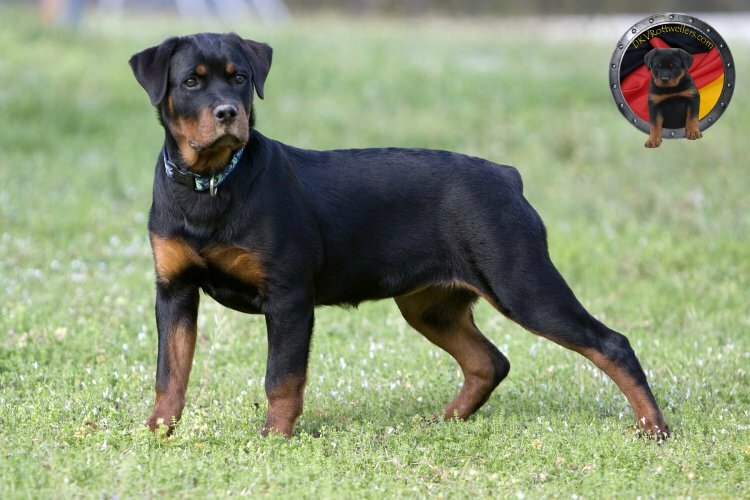 Rottweilers are prone to hip and elbow dysplasia, a malformation of the joints which can lead to crippling and a bone and cartilage problem called OCD. This can be prevented by properly exercising the dog and making sure that as a puppy, they don't suffer any joint stress. You can do this by limiting access to stairs, not allowing jumping and not over running the dog. A simple walk and play time each day will be enough Exercise for a puppy. Also ask the breeder if the dam and sire were tested for Health Problems, as most of the problems Rottweilers experience are hereditary. Rotties have a relatively short coat and not much grooming except brushing is needed. They have a double coat and shed twice yearly, usually in spring and again in the fall. Daily brushing is a needed and will prevent large amounts of hair from being released all over the home. This will also keep the coat soft and shiny. Frequent bathing is unnecessary and can lead to dry, flaky skin. A bath is only needed when the dog is dirty or has an odor. A natural, gentle shampoo is recommended for Rotties as they are prone to allergies. For in between baths, a doggy wipe or baby wipes will do. Rottweilers are prone to obesity, so daily exercise is necessary. A run in the park or a nice stroll around the neighborhood twice daily will do. Younger dogs should be watched carefully. Too much running and jumping can put stress on growing bones and lead to health problems in the future. Rotties love to play and would enjoy a nice game of fetch with a ball or stick. They also excel in agility and obedience. Be careful about off leash parks, as the Rottweiler is a herding dog and may try to herd running children and smaller dogs, injuring them unintentionally. Teaching them that this is an unacceptable behavior from an early age will prevent this situation from happening. Rottweilers are very intelligent and easily trained. They should be taught from an early age what is acceptable behavior and what is not. Like any dominant breed, Rottweilers must be handled with firm and consistent training. They need to be trained to respect and obey all family members. Socialization should start early by introducing the puppy to other dogs, strangers and new situations. These dogs love to play hard and could unintentionally injure or knock down a child. Proper manners must be taught to ensure that they behave properly around children. Rotties love to please and learn new tasks, making them quite fun to train. They do well in tracking, police work, agility, obedience and anything you put in front of them. If left alone for long periods of time, or if allowed to become bored, a Rottie can become quite destructive. Crate training is recommended. Start from an early age and be firm and consistent, don't give in to a crying puppy. Once a dog is comfortable in a crate, they will most likely be quiet and sleep, waiting for their loved owner to come home. To keep the dog busy in the crate, try giving him a Kong filled with frozen peanut butter. This will keep them busy and entertained.